As part of their constant battle to defend themselves against accusations of contributing to childhood obesity and an unhealthly lifestyle, as well as obesity lawsuits, McDonald's is now contributing money to scientific studies on the causes of childhood obesity. McDonald's has donated $2 million to the Scripps Institute for a "collaboration regarding research and educational initiatives to drive progress toward a solution to childhood obesity and Type 2 diabetes." "McDonald's overall goal is to make a difference in the lives of children," said Ralph Alvarez, president and chief operating officer, McDonald's Corporation. "The collaboration with Scripps Research is an extension of McDonald's long-standing commitment to the well-being of children around the world." Right. The collaboration with Scripps is something McDonald's can bring up in court when they're being sued for making kids fat! "More than 13 percent of children and adolescents in the United States are overweight and the number is growing at a critical rate,"said Richard A. Lerner, M.D., president of The Scripps Research Institute. "With obesity often comes debilitating, even fatal Type 2 diabetes. These are epidemics that America cannot ignore. The McDonald's and Scripps Research alignment represents advancement in the effort to change the landscape of these severe pediatric health issues." Doesn't Dr. Lerner realize that many of the kids in that 13% have gotten that way by eating nutritionally bereft meals made with high concentrations of HFCS at McDonald's, or does $2 million cause selective amnesia? What You Don't Know is Killling You! This may seem like a positive step toward educating the public about the unhealthy content in McDonald's foods, but the reality is that too many people will still ignore the label or continue to be uninformed that there is too much of everything bad in their foods. On my speaking tour this week, I met some wonderful people, two of whom brought this Happy Meal to my attention. I couldn't believe it when I saw it. I mean, most food doesn't last when it's not in the freezer because it decomposes, gets molded, gets rotten, or as well all say..."goes bad." Here is a picture of that hamburger and fries from that McDonalds Happy Meal that was purchased early in the year 2004 - that makes it more than TWO YEARS OLD!! Can you believe that there appears to be nothing different than their Happy Meals made today? Why is that so you ask? It's because there are absolutely NO living elements in their food!! That's right. An apple, orange, any fruits or any vegetables are living matter - they need water and nutrients to live (like us! ), otherwise you see fruits go stale or rotten, and wither away. Well, we need those same nutrients that fruits and vegetables provides. McDonald's foods has no living nutrients, so nothing of value is provided for our health. And there is no mold or any other living material that will "attack" the food! In fact, because there is nothing living in their food, there is nothing that can "die.! The food is nothing but preservatives and chemicals! I hope that this picture is worth more than a thousand words! Stay away from Fast Food! 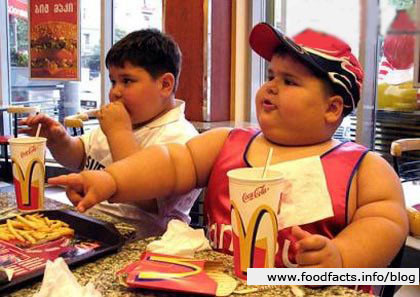 It’s a fact that McDonald’s is contributing to childhood obesity. Kids have the fastest metabolism, so how is it that they are getting fat? McDonald’s is a gold mine in the fast food industry! They might donated, two, five, even twenty million dollars to research for a solution to childhood obesity. But, that’s just to save face! What their serving is making them rich, so if they have to pay off lawsuits or donated money fine it’s just a drop in the bucket compared to much their racking in from people. McDonalds is doing what makes them money, even at the expense of people’s health. But their not forcing you to eat their food, this is America after all home of the free, we have the freedom to decide. The simple fact is that people today know that fast foods aren’t good for you. Kids don’t have money, kids don’t have cars, so how is it that they’re able to gain access to McDonald’s food day after day? Well, its not hard to figure out that parents are driving their kids to McDonald’s. Parents are taking their hard earned money, and welcoming their kids to a life style of bad health. I don’t believe that parents should be able to sue McDonald’s for contributing to childhood obesity and an unhealthy lifestyle. Parents who make these accusations should be force to take a year long nutrition class, to open their eye’s to the fact that they are the one’s causing their child’s overweight problem. Filing a lawsuit won’t help your child drop the weight, taking responsible for you acting, and doing something to solve the problem is the true solution. Fact: you have a chose so choose! I agree with this completely, thanks for the post. I agree that McDonald's should not be held responsible for obesity; it's up to the person to control themselves. It's sad how kids can't control themselves. You'd think their parents would step in and teach them proper eating habits, but I guess their parents are too busy stuffing their faces as well. I agree completly. It's not the companys' fault, it's the parent's fault. After all, McDonalds in not forcing anybody to eat their food; all they want is the money to go into their own pockets, they're not interested in anyones' health or well - being. So that's why it's up to the responsible adults (the parents) to make sure that they are raising their kids on a healthy, balanced diet, and not just going through the dredded "drive thru" for a happy meal for dinner each day. After all, no one cares about your children as much as you do for we are living in a morelley sefish world and so one should recongise that it's in their intrest to cook them PROPER food. You are what you eat, and you know it, everybody knows it. What everyone should be doing is thinking about what exactly they are about to eat every time they but a big mac meal from macdonalds. How many calories are there in this burger I'm about to eat? Where will all this fat go? For one moments pleasuring your mouth with fatty, oily food, how long labouring away will it take to burn off all this fat? My motto is nothing tastes as good as it feels. I believe that the comapany macdonald should raise the price of the burgers and promote more strongley the healthy stuff they sell such as carrot sticks and fruit bags. They should also place warning notes on the front of the card container that holds the fries cautioning them to realise just what they are potentialy doing to themselves, just like they do on cigarette packageing. You may be thinking that is going to far, but it's not. Obeisity is on the rise and we have to stop it some how. We should not hold McDonalds' as suspects for making all overweight people as they are. Moreover, in a world that is really "every man for himself" it is up to everybody to STOP and THINK! Otherwise it serves them right if they are morbidly obeise due to an addiction to McDonalds. It's up to US NOW to teach our children that it is wrong to copy what they see from addicted adults. what we cannot do it pass this obeisity on the the next generation. Are you all serious? Who cares what the fat intake of these children are! Are the parents ensuring that THEIR children get enough physicla exercise?!!? Get a clue! It's the parents fault NOT McDonalds!! I'm sure the starving children around the world wouldn't give a crap how much fat is these meals! McDonalds made me soooo fat! iF They raise prices then less people are going to go because they like the cheap crap. and about promoting the healthy sdtuff...do you realize that there is more calories in one of their salads then in a big mac... mise well eat the burger.. looks better. And the last time i ate in a mcdonalds they had a nutrient paper on the placemat. so it was there in your hands before you even had to ask. I work at a resturant and no we do not have packets that you can take home. But our salads are actualy healthy. But people choose to gert the combo large sized.. its the people. Not the food. In my opinion, I believe that McDonalds are not at fault for the obesity of people, due to the fact that they coveniently dine at their establishments. The number one reason for customers to flock to them is in the effors to feed their family, but without spending all on just one meal. You can go to a fast food resturant and spend about $15 and feed 4 peoples. The price for feeding your family at home would cost about twice that and maybe more. They only fill in the areas of need, by offering a product that meets the needs. You cantnot fault them for that. Secondly, I am hearing alot of peopls saying that they were lied to about the nutritional value in the food. Seriously, there is only but so much value in the food. They explain this to you whenever you purchase the food. By law they donnot have to tell you every little detail within the food, due to certain legal rights (or privileged information if it has been patiented). Lastly, we have a responsibility to ourselves and to our families. How can we expect our children to see us as taking responsibilities for our own actions if we first don't follow through? The company has a part to do, but at the same time there are others that have a share in this as well. The food industries, the parents, and even the law, to make it harder for the food industries to increase the prices so that people cann't afford it, and the parents when they know that their child are possibily sick, with the potential of having need of help. There is only but so far that reasonable thinking can take you; to where you must know for certain, and without a doubt, in the efforts make a conscious decision.